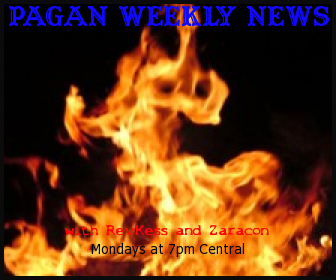 The 46th edition of Pagan Weekly News was rather heated and some what disjointed. For the latter we apologize. Zaracon had to sign off early due to stomach ailments and KaliSara was not prepared for filling in on anything other than the Zsuzsanna Budapest story. We started out with a follow-up to a story we were a little late in covering the first time. Over a year ago, Peter Lucas Moses was arrested and charged with the deaths of his 28 year old “wife” and her 4 year old son. Wife is in quotes, as the man had four wives and was the self proclaimed leader of the Black Hebrews, a religious group claiming to be the direct descendants of the ancient Israeli tribes. Moses has plead guilty to the killings, accepting a plea for two consecutive life sentences (rather than the death penalty) in exchange for his testimony against his sister, mother, and his three other “wives”. Read the full article here. We then moved onto the upcoming (Tuesday, 12 June 2012) vote in North Dakota regarding an amendment that would allow religious law (Christian religious law) to trump the laws of North Dakota and by extension the United States. A Christian form of Sharia Law that few are crying out against. We are expecting to do a brief follow-up on the result of that vote in next week’s edition. Read an editorial article from Addicting Information on this amendment. Our main story was about Zsuzsanna Budapest and her apparent continued attack on the transgender population, not just within the Pagan community, but as a portion of the global community. KaliSara chimed in on this discussion, as she has for our previous coverage about Z Budapest and her apparent hatred towards the trans community. (Hear those episodes here and here and most recently here.) KaliSara brought the current “rants” to our attention over the weekend, referring to two posts on Facebook by Budapest. Please read Budapest’s posts from Thursday and Friday, as well as the comments, for more information. After the rather heated discussion about Budapest, RevKess felt it would be a good idea to insert the introductory episode or segment from That Witchy Place with Peter Beckley. That Witchy Place is a podcast segment provided to the podcast community by Peter and his wife. The segments will cover topics of green living, Pagan homesteading, and other environmentally minded issues. Some of the segments may stray from that general theme, but all should be worth listening to. If you would like to hear those segments by themselves or are a podcaster who would like to include them in your own shows, please visit That Witchy Place for more information. We wrapped up the show with a brief run down of the 27 Essential Books on Paganism from Huffington Post’s Religion section of their online newspaper. We are inviting our listeners to submit to us their own lists of essential books on Paganism and spirituality for a future show. You can list them in comments on this blog, at our Facebook page or email them to us at paganmusings@gmail.com.